Yesterday I took my car to the tire store to have the snow tires put on. They are on rims so it was what they called a "switch," not a mount and balance (which is much more expensive). I forgot to check the tire pressure before I put the tires in the trunk of my car and decided to check it when I got home. Also, I have a tire pressure monitoring system on that car which is fairly accurate (but all TPMS I have are glitchy and tend to read low). After waiting a bit (the weather is turning and lots of people are putting on snow tires) I got my car back and drove home. As I pulled into the driveway each tire on the TPMS read around 37 psi. The recommended pressure is 30 psi. I grumbled. It seems (at least around here) every tire store over-inflates your tires. So later in the day I went out and lowered the pressure to 30 (which is probably a bit high considering how cold it was; see below). An overinflated tire is stiff and unyielding and the size of its footprint in contact with the road is reduced. If a vehicle's tires are overinflated by 6 psi, they could be damaged more easily when running over potholes or debris in the road. Higher inflated tires cannot isolate road irregularities well, causing them to ride harsher. Some people think over-inflating tires gives them better gas mileage. But it doesn't. Also, you can wear out your tire faster I've been told because the center will be taking more of the load and the middle will go bald faster than the edges. Some people think the tire pressure listed on the tire is what they should be inflated to but that's the maximum tire pressure the tire can handle, not the recommended pressure. Cars weigh different amounts so the same tire on a different car could have a different manufacturer's recommended tire pressure. Always check your owner's manual or newer cars have a sticker on the driver's side door jamb. Also, if you inflate your tires to that maximum pressure, then go drive 100 miles at 60 mph, the tire pressure will increase due to heat and, bam, you have a blowout! 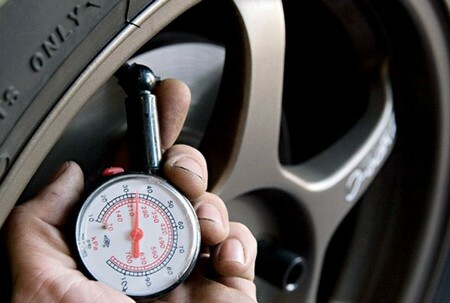 Set according to the vehicle manufacturer's cold tire pressure(s) recommended on the vehicle's tire placard or in its owner's manual. This must be done before rising ambient temperatures, the sun's radiant heat or even driving short distances temporarily warms the tires. (I once checked my tire pressure with one side of the car in the sun and once side in the shade and I was shocked at the difference.) And then there's a bunch of correction factors for temperature listed. They never say what the optimum ambient temperature is but I suspect it's about 68 degrees F (20 degrees C). Now, if you drive 100 miles at 70 mph, your psi will be about 2-3 pounds higher. That's okay. That's designed into the pressure and the design of the tire. If you start your car and it's 20 degrees F out your psi could be 3-4 pound low. Again, once the car gets moving the tires will warm up and that'll get them to the right pressure. You can't always maintain the correct pressure of 30 psi (or whatever is recommended for your vehicle). But you should try to get close with a good tire pressure gauge (I don't recommend the "stick" kind, not accurate enough). Your tires will thank you.